During the First World War 340 Australian Gas Light Company (AGL) workers enlisted to serve from a workforce of 3,000 employees at the Mortlake Gasworks and in metropolitan Sydney. In 1926 a memorial tablet to the 45 AGL employees who died in the First World War was unveiled at the work gates on Tennyson Road, Mortlake. Sadly, during the redevelopment of the AGL site as Breakfast Point the tablet was stolen. 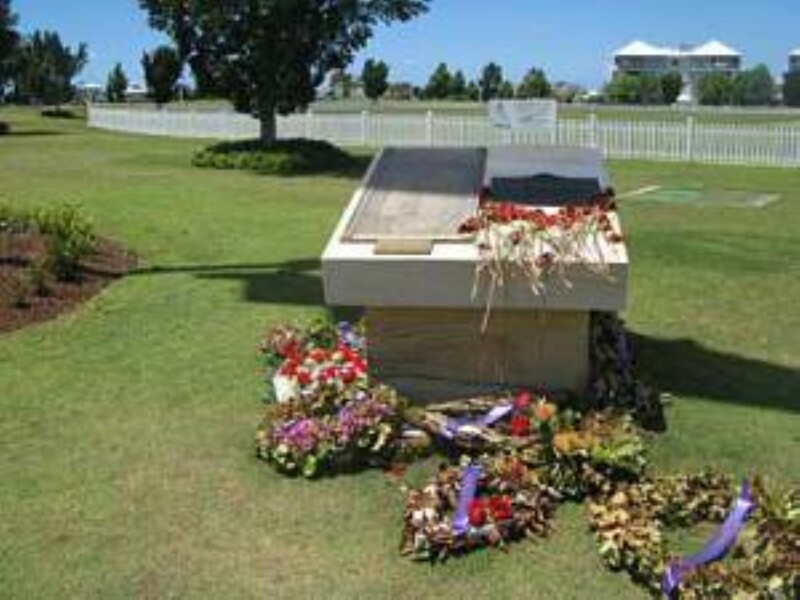 However a new war memorial was created to commemorate their service. Breakfast Point resident Greg Maunsell has researched the names of those listed on the Breakfast Point War memorial to create a web page in their honour. Greg will share the colourful and moving stories of the men associated with the Mortlake Gasworks who perished in the First World War at Concord Library on Tuesday, 15 April at 1pm. The City of Canada Bay Heritage Society will be hosting an open day at Yaralla on Sunday, 13 April 2014. Visitors will be able to enjoy a guided tour of the stables, dairy, squash court and grounds of the Yaralla Estate. There will also be a display of historic photographs, ‘Yaralla 1879-1970’. 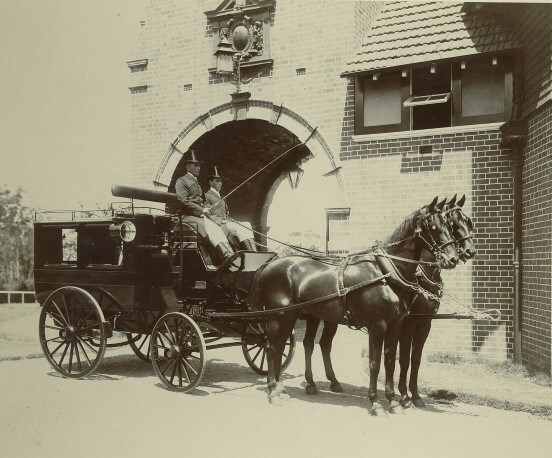 The photograph, above, is from an album of photographs held by the City of Canada Bay Museum and shows one of Yaralla estate’s horse drawn vehicles in front of the stables. The photograph was taken by Samuel Spink about 1910. Bookings for the open day are essential, details at City of Canada Bay Heritage Society. Five Dock Library is celebrating ten years in its present building. In the early part of the twentieth century, the first library at the Five Dock School of Arts required an annual subscription to borrow. 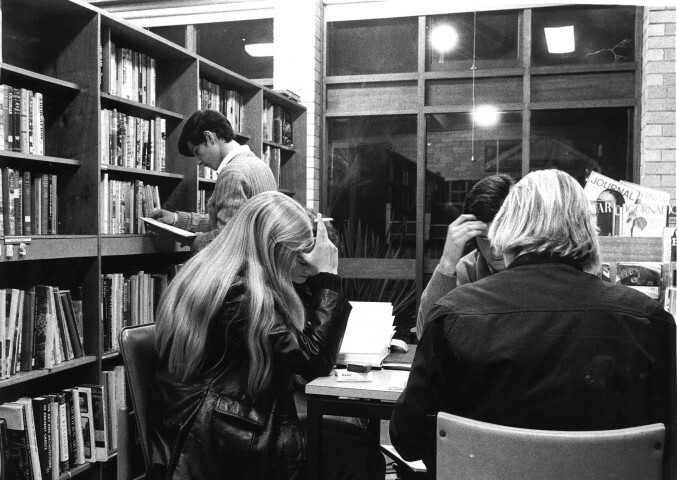 A free library service was introduced in 1966 when Drummoyne Council adopted the NSW Public Library Act. A new library was built on the site of the Five Dock School of Arts at 106 Great North Road and opened on the 8 December 1966. When the City of Canada Bay was formed in 2000, a new library service was developed to meet changing community needs and the present Five Dock Library was opened on 20 March 2004. There will be a range of activities at Five Dock Library to mark its ’10th birthday’, including a display which looks back at the changes in library services over the years. Some of the photographs on display can be seen on flickr. The photograph above was taken in 1970 at the old Five Dock Library.